Comodo Internet Security Essentials is a program that protects you when you are on the web and more specifically when you access your online banking accounts or when you shop. To do this, the software will run in the background and will check that all the sites you visit have a valid SSL certificate. As soon as Comodo Internet Security Essentials detects a potentially dangerous site, an alert window appears to alert the user. This tool is even more useful if you regularly use public Wi-Fi networks that are not always secure. 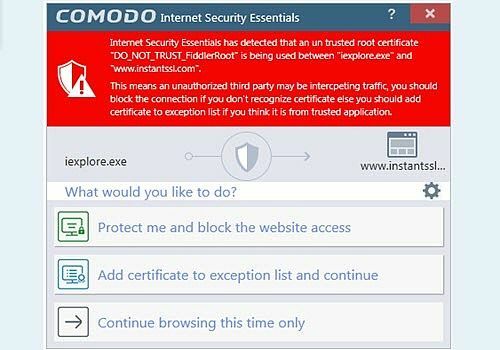 It should be noted that, for the time being, Comodo Internet Security Essentials only works with Internet Explorer. If you are still using a computer with a version of Windows that is not Windows 10, Comodo Internet Security Essentials is even more useful to you. This is a program that is available for free download.